This recipe for asparagus and fontina quiche is from the Magnolia Table cookbook by Joanna Gaines, and is perfect for Mother’s Day brunch, or any time you are craving a cheesy delicious treat! Mother’s Day is right around the corner, and I have two EXCELLENT ideas for you. The first is to make your mama this delectable asparagus and fontina quiche, full of bright springtime asparagus and creamy, dreamy fontina cheese. 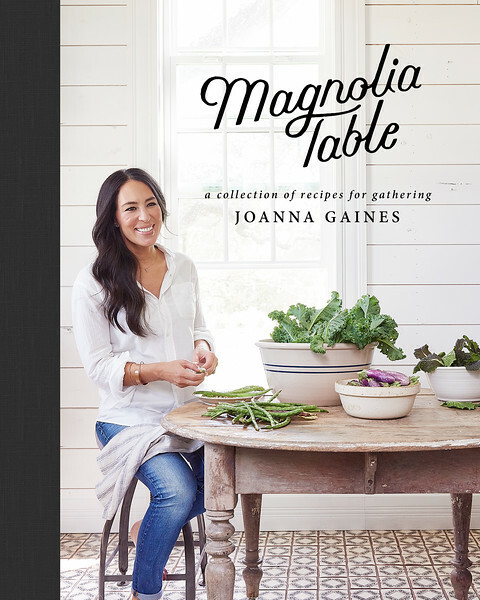 And the second is to give her a copy of Joanna Gaines’ brand new cookbook, MAGNOLIA TABLE. I think you might see where my latest giveaway is going, right? OH YES. So find some asparagus, think some good thoughts about your mama, and let’s make it! First of all, how excited are we that Joanna has a cookbook? So. Dang. Excited. I have to state for the record right here that I am watching Fixer-Upper on repeat (and still recovering from the fact that the show is over), and my favorite part is the kitchens. And those delectable platters of cookies she always has on the counter. So I couldn’t wait to get my hands on her latest book, and it’s a beauty. Full of recipes that are just perfect for celebrating with family, either on just a regular weeknight family supper, or on a special occasion like a Mother’s Day brunch. I turned directly to the desserts, and I have her lemon pie at the top of my must-make list for the lemon-pie-loving Southern husband, followed promptly by the recipe for the fried chicken with sticky poppy seed jam. I KNOW. But very first on my list is this delectable asparagus and fontina quiche, because asparagus is in season right this second, and as far as I am concerned cheese is always in season. I love the pretty design the asparagus makes as it cooks up. And to make everything even MORE delicious, I have three – three! – copies of this cookbook to give away. And one of them is signed by the wonderful Joanna herself, which I would dearly like to keep for my own self, but I’m not going to. Nope, I’m going to give it to one of you, my wonderful readers, because I love you more than all the cheese in the world. So here’s what you do: leave me a comment below telling me the thing you love best about either your own mother, or being a mother, or mothers in general, and on Saturday I will pick three lucky winners at random. And that way on Sunday morning you can give your mama an IOU for the wonderful MAGNOLIA TABLE cookbook that is coming her way. Or you can keep it all for your own self. I won’t judge. 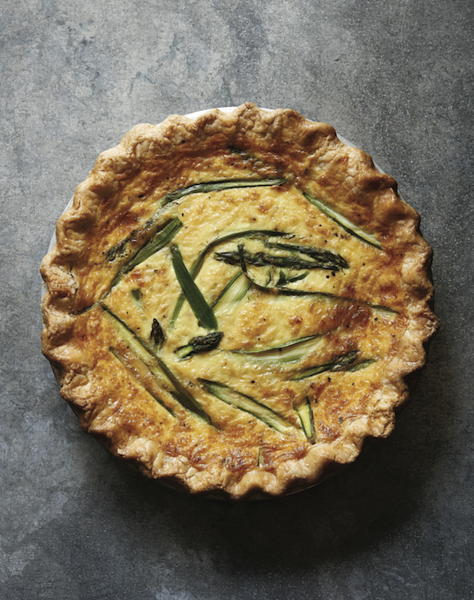 And in the meantime, get yourself some asparagus and make this gorgeous quiche! This giveaway is now closed, but you can still be a winner by making this delectable quiche! Preheat the oven to 350. Place the pie crust in a 9 inch pie plate. In a pot with a steamer insert or in a covered sauce pan fitted with an expandable steamer basket, bring two inches of water to a boil. Add the asparagus to the steamer insert or basket, cover, and steam until tender, about 30 seconds for strips and about 3 minutes for pieces. Rinse the asparagus under cold water to stop the cooking. Drain well and set aside. In a large bowl, whisk together the eggs, cream, garlic salt, and pepper. Stir in the Fontina, Gruyere, and reserved asparagus. Pour the mixture into the unbaked pie shell. Bake until lightly golden and set in the center when the pan is gently pushed, 40 to 45 minutes. If the crust is browning too quickly, cover it with foil to prevent it from burning. Remove from the oven and let stand for 5 to 10 minutes before serving. Cut into 6 or 8 slices and serve warm or at room temperature. The quiche is best served the day it is made. Tightly wrap leftovers with plastic wrap and store in the refrigerator for up to 2 days. *Recipe reprinted from MAGNOLIA TABLE with permission from HarperCollins Publishers. I love my mom because I know whenever I came home as a kid (OR whenever she visits me now as an adult!) I can always count on a delicious hot meal to warm my soul since I may not be the best chef around ???? and while I love all those childhood favorites, mixing it up with new recipes to help her with could be fun too ???????? Plus this particular recipe has asparagus. Which is currently my favorite food at the moment ???? This recipe looks amazing… and currently enjoying an abundance of asparagus in California! My grandma is the quintessential, sweet, ‘let-me-fix-something-for-you-to-eat’ grandma, and the experience of being nurtured by her is one of my favorite memories! My sister just became a new mother at 37 and it’s amazing to see how much love she has for her daughter. My sister isn’t the most affectionate person as we were raised in a family that found sharing emotions awkward, so it’s fun to see her gushing over her child when she’s never done that with anyone. I love seeing her with my niece! My mother was pure love and I miss her dearly. Thanks for the giveaway! That Joanna is a peach. I was a picky child and my mother catered to my needs. She made special meals to make sure I ate, packed amazing lunches (no sandwiches in my lunchbox), and made my favorite birthday cake each year – even though it would have been so much easier to order from the bakery. I don’t know how she did it while always making sure the rest of the family was always cared for. I love that my mom always cared about feeding us the best things for our bodies while still making sure it was super delicious! There was never a question of living veggies the way she makes them!!! I love my mother because she loves me unconditionally. We are so much the same! She is a Christian role model. She waited until her children were in school before she started her career as a nurse. I love being a mother because since I couldn’t have children of my own, I received two wonderful children when I married my husband. I am honored to have these children in my life and they accept me as their Queen Mother!!!! I did not grow up with a Mom, but loved being a Mom to my two now-grown daughters!! Moms are the hardest working people on the planet! They do it all for the family before doing for themselves. My Mother was always there for me, even when I was wrong, she had my back. I hope I have let my kids know I too have their backs. I lost my mom 2 years ago to Dementia. She battled the disease over 12 years. The Drs, groups, online and practically anything we could get our hands on to help us we read, etc. One of the most significant changes was her ability to cook, remember ingredients. She was one of the best “from scratch” cooks ever! At the beginning of the disease I bought her journals to write in her recipes and wonderful memories. I can’t even begin to tell y’all how I cherish those recipes, those hand written words. I try my best to recreate Mama’s recipes but they never quite taste as good as I remember. Cooking was just my thing with Mama my sisters had their own things to. That was another wonderful thing about Mama she made each one of her girls feel special in their own way that made us feel so unique. Mama was good like that. I miss her more every single day. My children are now grown and I am so proud of the adults they have become. They are successful in their jobs and still maintain the compassion they were raised with, volunteering at their jobs and raising money for charity. Can’t wait to make this! I may make this today, definitely this week, as my daughter loves quiche! Do you have a suggestion for a store-bought 9-inch pie crust? I find that they usually aren’t deep enough. The thing I love best about my mother is the cooking legacy she passed on to me! Thank you for this recipe and ALL of your recipes!! My mom passed away in 2005. Every year on Mother’s Day I go to the cemetery to decorate her grave. I too am already feeling sad about Fixer Upper going away. This is so awesome and that looks so good! I love my Mama because she is truly my best friend. She has the best heart and loves unconditionally. I have great memories of cooking a week’s worth of meals every Saturday with Mom. I learned great cooking and life lessons during those sessions! I miss my Mom every day! I was lucky to visit Magnolia Market a while back…what a fun day! My mom truly loves me unconditionally, goodness knows I’ve tested her throughout the years. My mother taught me to be a strong woman open to new ideas and adventures. In her quiet and loving way, she allowed me to become a person capable of thinking for myself and able to see individuals as potential friends. She gave me the freedom and encouragement to follow my dreams. This quiche looks amazing! A perfect brunch entree! I can’t wait to try o try that fried chicken recipe of hers- YUM!!! My mom passed away this year, so with Motherhood Day approaching I’ve really been focusing on the fun I’ve been having being a mommy to our four year old daughter. She’s a total miracle baby- and was born just before our 20th wedding anniversary! I love this age where she’s developing interests, is curious about everything and still wants her mommy around all the tim. Most of all I love her sweet hugs and kisses and the constant “I love you, Mommy!”. Being a mom is truly the best thing in the universe. I’m so blessed! I love my mom because she is the most hard working, caring, selfless person I habe ever known. She is generous almost to a fault and would absolutely give anyone the shirt off her back. She is an amazing nanny to my 2 little ones and they absolutely adore her. Now that I’m a mom i feel we can connect better – even commiserate sometimes! I love my mom because she is the most hard working, caring, selfless person I have ever known. She is generous almost to a fault and would absolutely give anyone the shirt off her back. She is an amazing nanny to my 2 little ones and they absolutely adore her. Now that I’m a mom i feel we can connect better – even commiserate sometimes! My mom was the best (we lost her to cancer way too soon) but she was a quilter, a nurse, a friend to all and a real wonder woman to those who knew her. I hope my kids feel the same about me one day. Happy Mother’s Day to you!